To use boxing terminology, the Thomson Clyde is in the middle­weight class; light enough to move around easily and fully equipped for "staying". It was brought out at Motor Show time with an eye on the potential caravan touring and living public. With this type of van there is always a danger of falling between two stools, too much equipment for touring and not enough for living purposes. Thomson, however, have wisely concentrat­ed on warmth and comfort, providing a hot water supply, a solid fuel stove and they have also given plenty of leg room in a 17-footer by making it a centre kitchen van. The van was tested over a 180 mile run in the bleak weather of February, and the Clyde travelled very well indeed behind the editorial Wolseley 6-80 with perfect steadiness at the 30 mph limit, and apparently a fair amount in hand. Winter is not the time to examine the undergear in comfort, but fortunately the Clyde came from Ferraris of Crickle­wood and we were able to crawl under­neath the van in their covered showrooms. The chassis is fairly convention­al, being made up, with the exception of a 2in x ¼in. angle cross member, of 3 x 2 x ?in. channel. There are five cross members and two longitudinals , welded up into box sections at the spring shackles. The same method of reinforce­ment is used for the drawbar arms where they emerge from under the body. The drawbar, of Y form, extends well back and for extra rigidity two channel steel arms are welded between the apex of the drawbar and the corners of the chassis frame. The axle is 1¾in. square and straight and the van is well­ tyred with 6.50-16 Dunlops . 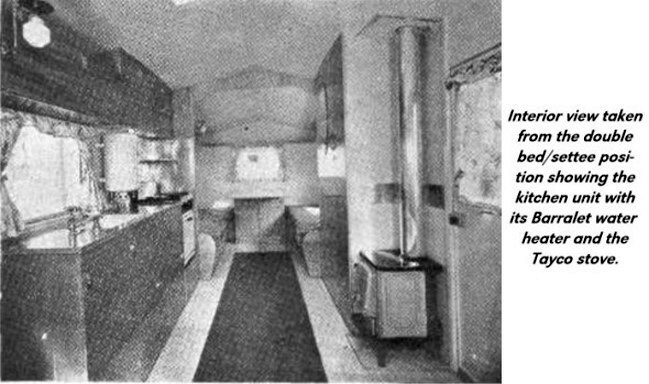 The Tayco stove had been taken out of the van in the course of modification by F.O.C. so it was not possible to get an accurate figure for the nose-weight in standard trim, but without the stove it was an easy matter to lift the drawbar for coupling up and, with the help of a slide and clamp jockey wheel, manoeuv­ring the van was quite simple. A check on the overrun brake before we moved off showed it to be quite ineffective and although it didn't take long to fiddle about with the slack cable and link to fix it, nevertheless the efficiency of overrun braking is most important. This isn't the only van tested that has been sent out with the brakes not properly adjusted and it is a point to be watched by makers. In appearance the Clyde is like an extended version of the Almond, with its ridged roof, a sandwich of Fibreglass between hardboard topped by painted canvas, exterior walls of alum­inium , and inside panelling of hardboard painted cream. The floor is tongued and grooved hardwood and, to guard against draughts caused through shrinkage, this is covered by hardboard and lino . The tangible result of this well-made insulated shell was apparent when Newmarket was covered in snow. 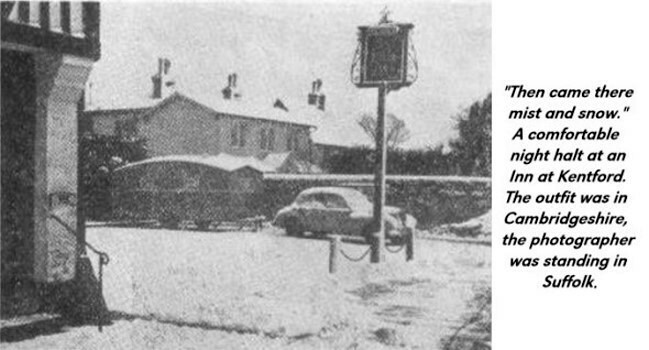 With an Aladdin heater burn­ing through the night and the roof vent open we slept as snug as the proverbial bug and didn't hear the snowplough clatter by at some unearthly hour in the morning. 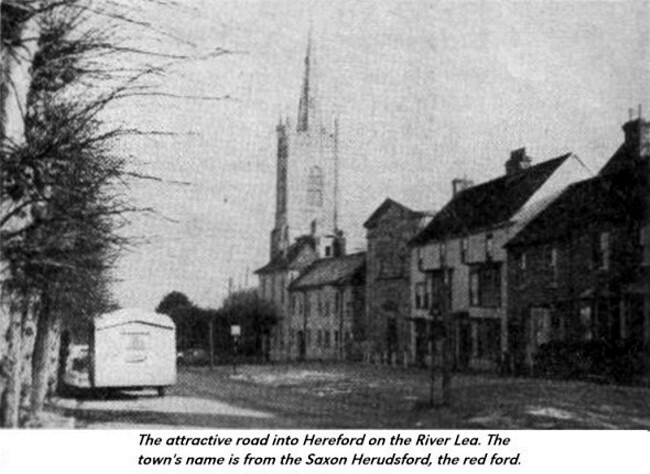 The windows are placed at each end of the van, two on the offside and one on the nearside. They are all 20 x 30in., with polished aluminium frames, and have side fixing stays and screw retain­ing catches. The curtains are cotton prints with pelmets to match, the bright side of the pattern facing outside to' impress the neighbours . The curtains are held back by tapes, easily tied and untied. The door on the nearside is glazed and has a neat handle in the centre so that it can be shut easily without groping for the cylinder lock. Across the front end wall is a double bed/settee which pulls out on its own legs; comfortable for long folk (6ft. 6in.) not so good for wide people (3ft. 9in.). The kitchen unit along the offside wall is attractive in appearance, 4ft. 9in. x 1ft . 5in. of hand polished oak veneer, but not as practical as it might be. The square enamelled steel sink is set into, the centre of the wood with a loose~ cover which turns upside down to form a small aluminium drainer. It is - im­possible to wash without splashing the wood. The Bottogas Royston at the end of the unit has a very useful rack above, but again if any serious cooking is taking place and saucepans have to be interchanged it is not easy to remember the hand polished oak in the flurry of culinary art. Fixed to the wall on the right of the sink is a Barralet gas fired water heater, an excellent device. When this storage heater is full of hot water, the gas jet dies down to a glimmer and as the hot water is drawn off, by pushing it out with fresh cold water via a hand pump, the gas roars into action again. On the move it is advisable to syphon off the water from the Barralet or else it will splash out of the top. The water system is quite ingenious. An eight-gallon tank is housed in the kitchen unit and filled from a tap outside the van. There is a single action plunger pump and a tap by the sink. When the tap is closed, cold water displaces the hot from the heater; when the tap is open, cold water is pumped direct from the tank. Above the kitchen unit are roof lockers, with a square of aluminium to protect the wood immediately above the Barralet . There may be a tendency for the single panelled doors to warp in the heat. Three large cupboards complete the kitchen unit, the centre one being the ventilated gas locker. The other cupboards are not ventilated although they are ideally placed for a larder. Instead the cupboard between the two beds at the rear of the van has a louvred vent, but it is not near enough to the kitchen to be convenient as a larder, and is inaccessible when the wardrobe door partition is across. In the prototype of the Clyde, the doors on this cupboard were hinged at the centre so that when the table was in place, the tomato sauce, knitting or what have you could be reached easily. Unfortunately this good idea has not been adhered to. The table (3ft. x 2ft. 5in.) has a tubular metal leg with a rubber stop on the end. There is an alternative position for it on the kitchen unit by the settee and when not in use it clips neatly out of the way against the wall on the near side of the settee. The single beds have 6ft. x 2ft. mattresses and are very comfortable. Access to the bedding lockers is by fall-front doors so that small items can be stowed easily but it is a bit more difficult to insert pillows and bedding generally. Above the beds are roof lockers and shelves. Opposite the cooker is a first-class wardrobe, 45ins. wide. Inside the door, which has a mirror, on the right are shelves for shirts, underclothes, etc. There is an extending hanging rail, four hooks, a shelf for hats and a shelf for shoes. Next to the wardrobe by the door is the Tayco stove with an asbestos surround. Lighting comes from a gaslight over the kitchen and in the end bedroom and electric lights on either side of the offside fixed partition. If these are in use for any length of time the rear Light bulb would have to be removed as it is on the same circuit as these lights. There are a pair of metal roof vents on either side of the partition, fixed so that they open on spring-loaded .arms in opposite directions, and painted to reduce condensation. Fortunately we had the right vents open when the snow came down at night. Last item of equipment is a carpet strip to add to one's comfort. The Clyde had quite a run round on all road conditions, and in most weather conditions and proved itself as a tour­ing van. Without giving luxury it has the essentials for living purposes, and the points we have criticised could be improved by any handyman without much difficulty. For those who want mobile housing at less than de luxe prices the Clyde is certainly a van to be Considered . Price : £560 plus £3 15s. P.T. Unladen weight : 18 cwt. Weight ex works : 27 cwt. Dimensions : Body length 16ft.11ins. ; shipping length l9ft. tins. 4ins. ; Overall width 7ft. 4ins. ; body width 7ft. Overall height 9ft. Interior width 6 ft. 9ins. ; working length l2ft. 4ins. Towing height, ground to fixing holes, l7ins. 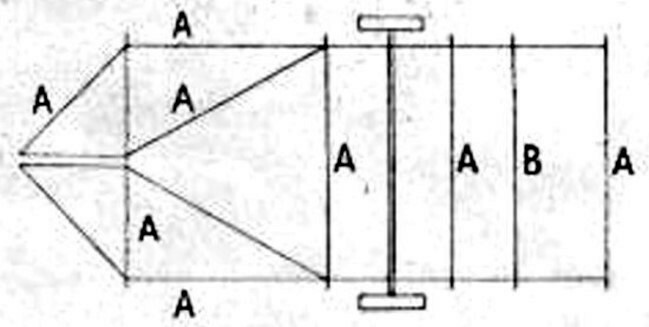 Undergear (sketch not to scale): A 3 x 2 x ?in, channel steel; B 2 x ¼in. angle. Box section at spring hangers, drawbar members reinforced, trusses from nose to front frame corners. Axle 1¾in . square straight. Half-elliptic springs, nine leaves, 36 x 2 x ?in. Cam brakes, overrun cable operated. Dunlop tyres 6.50-16. Brockhouse coupling. Clamp fixing retractable jockey wheel. Brace operated legs. Equipment . Double bed/settee 6ft. 6ins x 3ft. 9ins. Two single beds 6Oft. x 2ft. Spring interior mattresses. Centre kitchen. Botto­gas Royston cooker, folding rack over. Enamelled sink. Built-in water tank, 8galls., hand pump. Barralet's gas-fired water heater. Ventilated gas cupboard and two others in kitchen. Ventilated cupboard at rear. Wardrobe 45 x l7ins., partition to roof. Mirror. Hook-on table 36 x 28ins. Tayco solid fuel heating stove. Five roof lockers shelves. Two gas lights. Two electric lights. Carpet strip. Layout : A double bed/settee ; B table stowed; C shelves; D bed support housing water tank; E kitchen unit; F lockers; G water heater; H cooker; I single beds; K cupboard ; L table ; M wardrobe N heating stove. Towing car for test: Wolseley 6.80, 1950. Makers: Thomsons (Carron) Ltd., Falkirk. On NCC Approved List. 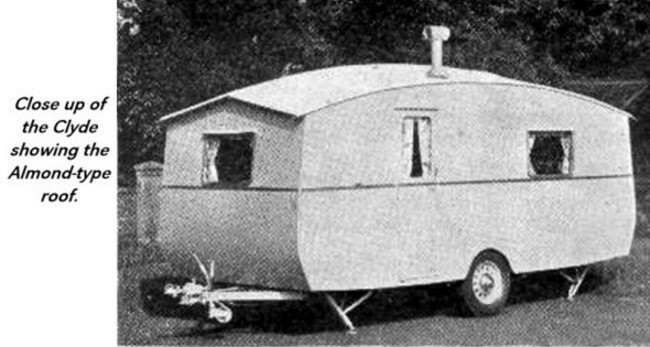 "Reproduced from an article in a 1954 issue of The Caravan"